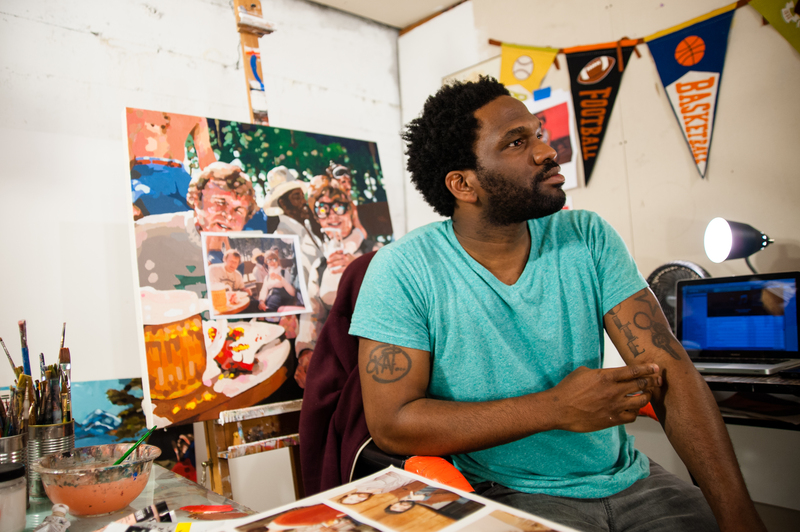 We caught up with our May artist, Jeremy Okai Davis in his studio space last week to talk a little bit more about painting, old photographs and basketball. Duplex: How did you make it to Portland? Jeremy Okai Davis: My entire upbringing was as a basketball player, my whole family basically played ball, so I followed that path. That was first and foremost for me up until my freshman year in college. I got a partial scholarship to Brevard College right outside Asheville, North Carolina. I just kind of had, not a bad experience, but an eye opening experience that led me to the decision to focus on art. I realized I wasn’t going to be an NBA player and had to make a choice that would actually be sustainable as a career. 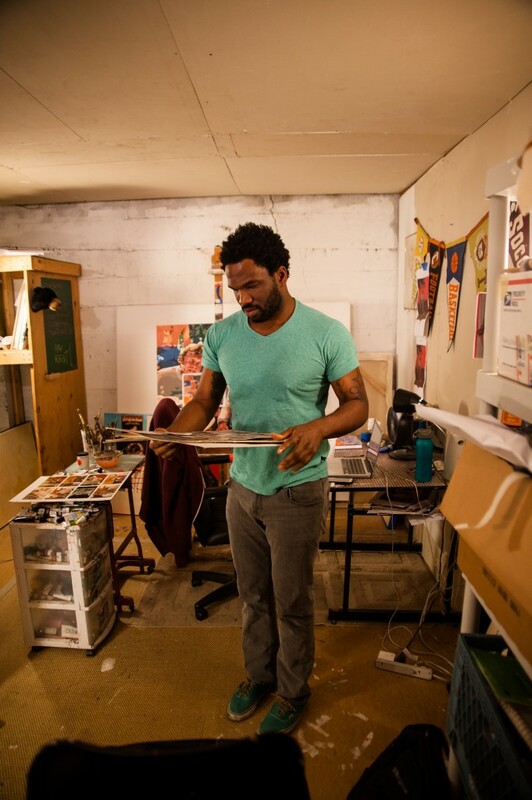 I always painted or drew so I moved back to Charlotte and went to UNCC to join the art program. I graduated in 2002 and stayed in Charlotte for about six years. I had some shows, but was having a hard time finding an art scene that appealed to me, so I had to kind of make my own way. Similar to what I did when I first got here, I would show in random coffee shops, bars and diners. Really anyone that would let me put my work up. I did that for about five or six years and felt like I exhausted all my opportunities. I had a friend that lived in Portland. I visited once and fell in love with the city, so I made my way out here in 2007. 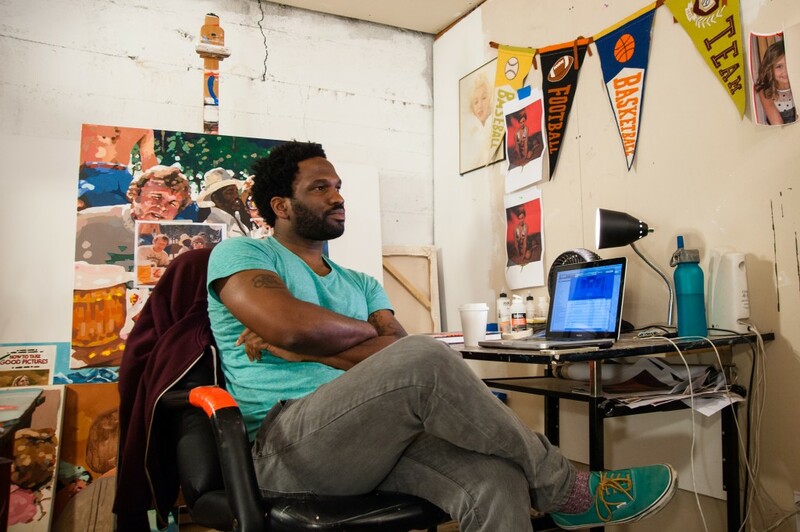 D: Did you struggle with the athlete versus artist identity? JOD: I wouldn’t say I struggled with it necessarily. Sports at universities are a whole other world than in high school. There’s no way around that, so that was my only struggle, I had to make the choice and I chose art. D: You are obviously drawn to painting; do you work in other mediums? JOD: When I was a kid I would draw all of the time, with my brother making up our own Transformer and G.I. Joe characters. I just kept it up as we got older. When I was in high school I had a teacher who was really open to letting his students do whatever they wanted. I was intrigued by painting, but really art in general. The idea that you could do anything you wanted to. I just stuck with that idea moving forward. As far as being solely a painter, I’m just really drawn to the medium and the flexibility it provides. I maintain a sketchbook that I draw in but rarely show that work. D: What attracts you to the portrait and to figure painting? JOD: I really like seeing an image or photograph of a person that evokes a warm feeling and the idea of making that into a painting that creates the same feeling in the viewer. I’ve always been drawn to that dynamic. D: Is that feeling what you are looking for in these found photographs for this series? 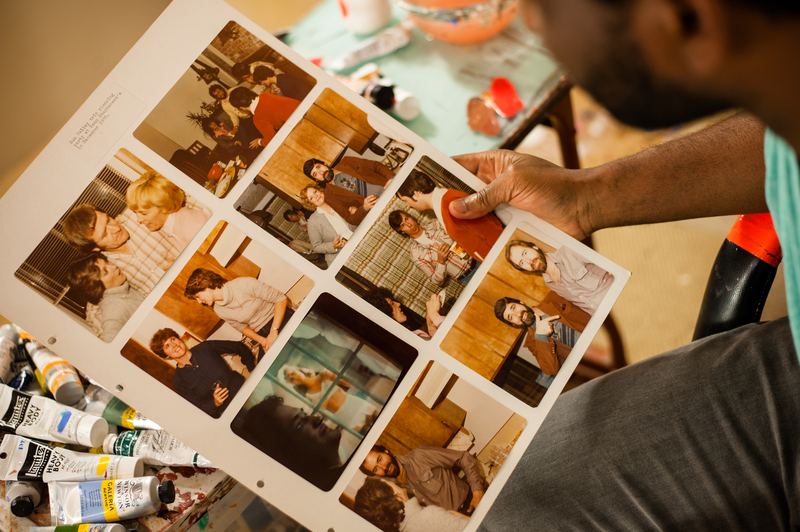 JOD: Yes, my previous landlord gave me these photos and I just love thinking about what was going on at the time these images were taken, what was going on in the subject’s lives at the time. I wanted to investigate that and recreate that in the paintings. D: Yeah, the 1980’s palette of these is a combination of the color of the film and the popular styles of the time: warm and very earthy. JOD: It’s been a challenge with the acrylic paint to try to mute it down. My work is usually pretty vibrant and I’ve had to tone it down for this show. D: It’s interesting to see the difference between the colors in the photos to the brighter colors in the painting. The color in real life would have actually been brighter and lively, but now it has faded over time. JOD: I’m attracted to that as well, I’m also a photographer. 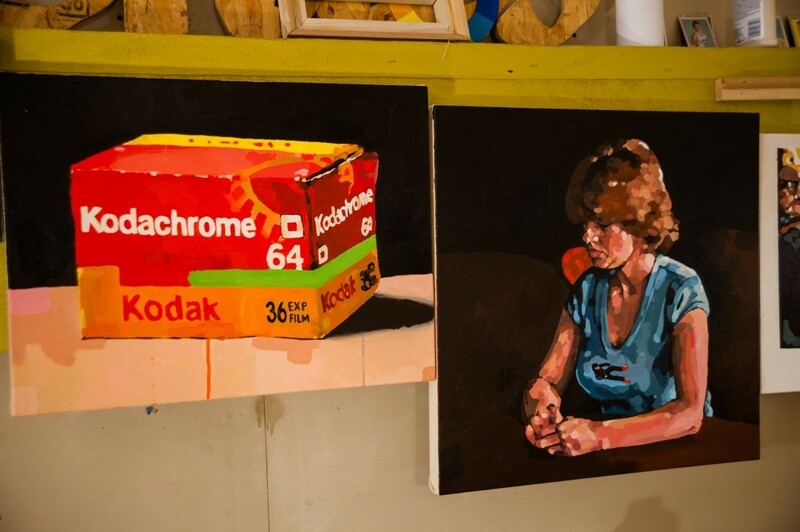 I want people to know that the paintings were sourced from photographs, so I included the image of the Kodachrome box and the labels that refer to the photos. 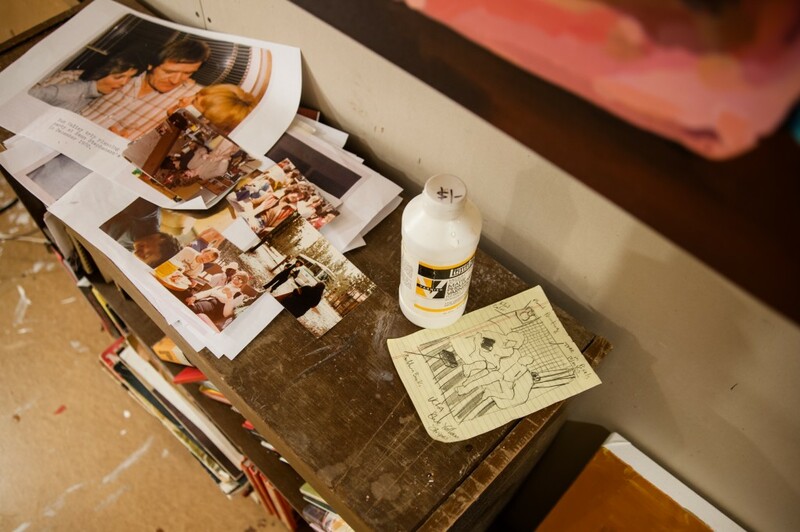 D: The labels on these photographs are so detailed. Did you go down the Facebook rabbit-hole to find some of these people? JOD: I messaged a few, but never got any responses. I did find one woman who responded, and asked, “Where did you get those?” She sounded really excited, but never got back to me. Then I got to thinking “Where did you get those?” might not have been a positive response. D: Where did your landlord get them? JOD: I thought he got them from one of his properties, which I thought was interesting, someone just leaving behind their photos. But there was a company in his building called Bergfreunde, or Mountain Friends. They set up trips for friends to take. I think they were just cleaning house and threw the photos away. D: These are all the same group of friends on vacation? JOD: Yeah, it seems to be a circle of about 20 people. D: It’s surprising that no one followed up with you. If this were such a big part of their lives at one point, you would think they would be excited to revisit it. JOD: I was, I wasn’t even there and was excited to try and live through these photos! I wanted to pay homage to them, to photography, and documentation in general. D: You definitely have an affinity for ’70s and early ’80s imagery and style. Have you always had or has this developed out of the project? JOD: Probably since around the time I moved here. I think I’ve been attracted to fashion in general. It seems like now there’s definitely a ’70s revival with how some people dress, and I’ve always been attracted to that style. I was born in ’79 so maybe it’s a curiosity about the time I came to be, what was going on in those days. D: Do you work typically from life or photographs? JOD: Photographs, I don’t work particularly fast and I work on everything at once. So it works better that way. I can go back and forth with pieces. 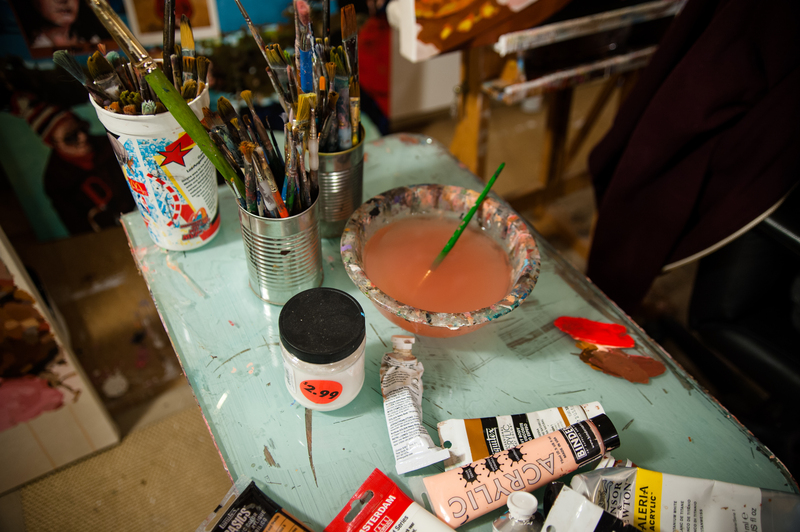 I usually work in acrylic on canvas, and bouncing around gives the pieces time to dry which lends itself to the layering I do with the paints. I sometimes work on panel too, like this piece for an upcoming show at P:ear. They asked us to recreate an album cover that meant a lot to us at some point and provided the panels to work from. D: You have such a touch with skin tone, I always admire painters than can push in and out so easily, and pulling out the most beautiful colors you don’t usually see. JOD: One of the first bodies of work I did was based on portraits, images of my group of friends. I had small images I pulled of My Space or Friendster or something, back in 2004. I blew them up to work from and when you blow them up, the skin tones sort of break down and you start to see pixels. That’s basically where this style came from, like trying to paint pixels. So these pinks and greens pop out in the skin tones. The color is all there for your eye to blend when you step back but up close you can see them all. D: So with this painting you included these book titles, how do they relate? JOD: Early on in this process I was interested in books on instruction, like “This is how you take a photograph” or “This is how you form a relationship or maintain a friendship.” In that image she’s passing him the camera, which I thought was interesting; a photo of something else about to be photographed. The thought of trusting this friend with the documentation, hoping he takes a great picture. D: What’s after this series? JOD: I think I’ll continue with these, I have too many for Duplex so I think I’ll just keep going with the project maybe find another gallery to house them. It always takes me finding a space to show the work in order to create the work, so doing some looking around for the next venue will probably start soon. 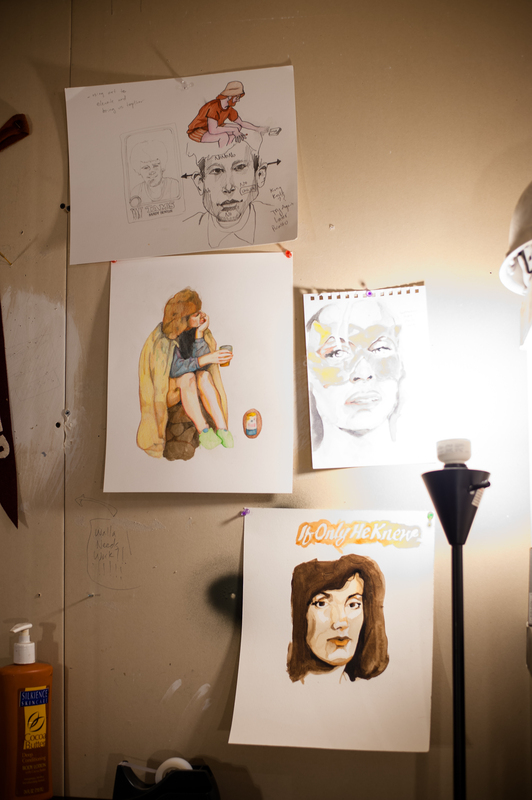 I have some personal projects; I have a commission through Oregon State University to do some paintings for them. There’s a new cultural building and they had a call for interest. I submitted in December. I had to do a twenty-minute presentation on my body of work. They chose me and another artist. 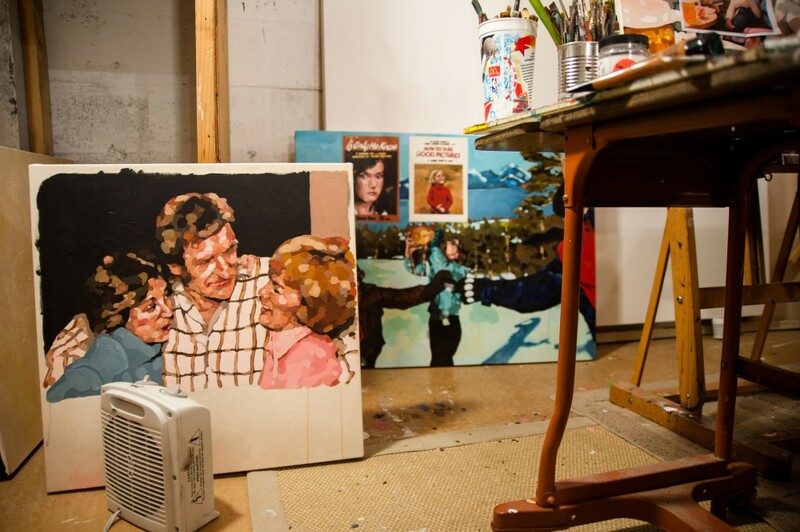 I’ll be doing a large-scale painting based around civil rights and jazz and then twenty-four smaller portraits for the conference room and a midsize piece of the buildings name sake Lonnie B. Harris. It will be installed mid September, in time for the next school year. I do illustration work for a few magazines, so that’s always in the queue.